# The name of the file with the list of names. Full path should be included. # Put the file name inside the quotes. Leave the r there. E.G. r"E:\Names.txt"
2. go to the browser (top of the folder you'll see a browser bar) of that folder, highlight and copy it. Next paragraph... No full path here. Just put the "NameOfYourTag-AddText" between the 2 quotes (Note the hyphen between your tag name and AddText) Like this: "eloisethankyou-AddText"
Skip the next paragraph and go to the following one about "Text Formatting". Do the same as you did for AddText but use "NameOfYourTag-TextFormatting" (again note the hyphen between your TagName and TextFormatting) Again, Like this: "eloisethankyou-TextFormatting"
Next para is optional. This is where you can put the name of your tag - "eloisethankyou_"
Note: what this does is place the tag name at the front of the tag when it makes it. Using an underscore line after the tag name seperates that from the person's name. Next para. You need to set your jpg compression. Most recommend 10. You can choose whatever you want but you shouldn't go higher than 15. The higher you go the less quality you receive. Next para is about Upper, Lower, Mixed, cases for your text. Example: "Cathie" is a mixed case or MC, "cathie" is lower case or LC, and "CATHIE" is upper case or UC.... If you set this to MC, the script will adjust if a name on your list is all lower or upper case. Next para keep at "Y"
Next para is about your side borders. If you have a framed graphic and it is 10 pixels wide you should put about 12-13 there so if you happen to have a really long name it won't place it on your frame. Allow just enough extra above the size of your frame. If you are making a psp image w/no borders use a 3 so the text won't run off the image space. This para is how you are aligning your text. H for across horizontal and V for up and down vertical. Most use H when scripting as it adjusts if you have angled text. This one is about centering your text. Do you want it aligned to the left side, use "L" or justified right side, use "R", or centered, use "C". The next two use "N" all the time. Once you finish all of this go to the top - File/Save As - Then save it; YourTagName-MakeTags.pspscript and save it in your Tag Name folder. 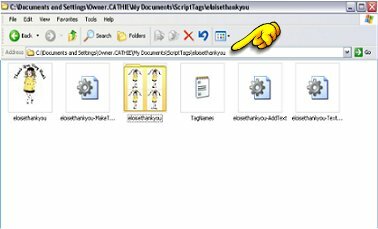 Example: eloisethankyou-MakeTags.pspscript saved in the eloisethankyou folder. This tutorial was written and graphics used were created by Cathie. Any similarities to other tutorials is merely a coincidence.